This friday AEGEE-Dresden is taking part at the summer celebration Schampus auf dem Campus – an initiative from students for students! 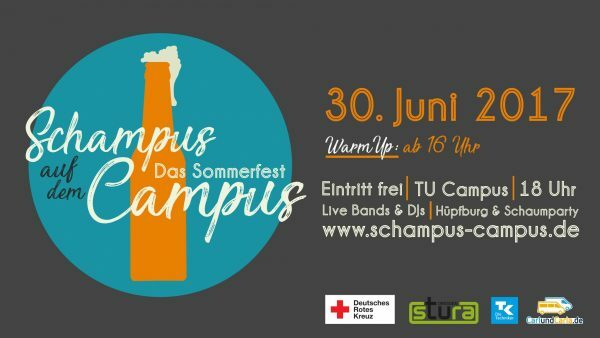 Schampus auf dem Campus (champagne at campus) is organized by StuRa TU Dresden, the Fachschaftsräte (student representatives) and many university groups. This years first time students can enjoy the atmosphere of an funfair, this includes a bouncer castle and later that evening a foam party. In addition AEGEE-Dresden prepared many funny and crazy games at their booth. Just pay us a visit and be sure to not go home thirsty! Of course the entry is #free and you will find a wide range of not only activities but also tasty food and drinks. Visit the HSZ meadow this friday for Schampus auf dem Campus!